The parents of missing girl Madeleine McCann have met Home Secretary Theresa May to discuss the search. Madeleine, from Rothley, Leicestershire, disappeared from a holiday flat in Praia da Luz on the Algarve in May 2007, aged three. 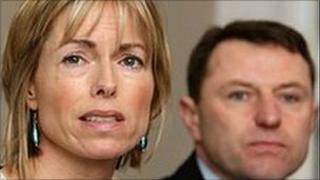 Before the meeting on Wednesday, Kate and Gerry McCann had called for an independent review of the case. Details of the talks have not been released but the couple had complained about the amount of help offered. In February they said they had encountered "reluctance" when asking the British authorities to re-examine the information held by law enforcement agencies around the world. A Home Office spokesman said: "The Home Secretary held a private meeting with Kate and Gerry McCann on Wednesday to discuss the case of their missing daughter Madeleine. "The government's primary concern in this matter is the wellbeing of Madeleine McCann, and to ensure that everything feasible is being done to progress the search for her." The talks follow on from the couple's meeting with Prime Minister David Cameron before the General Election. An investigation by Portuguese police was formally shelved in July 2008 without reaching any firm conclusions about the child's fate. Private detectives employed by the McCanns are continuing to investigate the case.